Draft: 1996, Texas Rangers, 1st rd. Helped form a non-profit organization called Honoring Thy Father Mission, aimed at reaching out to school, athletic and church youth groups as well as performing missionary work in Latin American countries... Active in the Fellowship of Christian Athletes...Was the recipient of the "Ya Gotta Have Heart" Award at the BBWAA Dinner on 1/25/11...Received the "Tennessee Male Athlete of the Year" Award on 2/11/11 in Nashville, TN... Was inducted into the Tennessee Baseball Hall of Fame on 1/18/12... Climbed Mount Kilimanjaro in January, 2012 with Mets bullpen catcher Dave Racaniello and former teammate, pitcher Kevin Slowey…Raised over $100,000 during the climb for Bombay Teen Challenge, an organization dedicated to rescuing young women from forced prostitution...Honored at the Thurman Munson Dinner on 1/31/12 with a "Thurman Award. "...His autobiography "Wherever I Wind Up, My Quest for Truth, Authenticity and the Perfect Knuckleball" was released in March, 2012...Authored a second book "Knuckleball Ned", a children's book in 2014...Is featured in a documentary film titled "Knuckleball."... Received an Honorary Doctorate of Sacred Letter form Wycliffe College (Toronto) in 2013. In his fourth season with Toronto, compiled his highest ERA (4.46) since becoming a full-time starter in 2010…His 169.2 IP were his fewest since 2010, while he lost a career-most 15 games...Snapped a fi ve-season string of at least 200.0 IP… From 2011-2015, tossed the fourth-most innings in MLB (1,097.0)…Only James Shields (1135.0), Clayton Kershaw (1128.0) and Felix Herandez (1107.2) worked more...Went 3-8 with a 5.28 ERA (52 ER/88.2 IP) in 15 games at home, while fi nishing 7-7 with a 3.56 ERA (32 ER/81.0 IP) in 15 road games, 14 starts... After the fi rst of August, compiled a 3.76 ERA (16 ER/38.1 IP) and allowed only two home runs over eight games, seven starts to fi nish the season… From the beginning of the season through the end of July, tied for the MLB lead with 26 home runs allowed while tying for second with 12 losses. Finished as the second fastest working pitcher in the majors, taking an average of 18.3 seconds between pitches according to PITCHf/x data… Only Wade Miley (17.8 seconds) worked quicker... Induced 21 groundball double plays, tied for ninth most in the majors. Made his season debut in TOR's second game of the season on 4/4 at TB, earning the win after tossing 5.0 innings and allowing three runs, earned, in a 5-3 victory…Has worked the first or second game of the season every year since 2012…Was the Blue Jays' Opening Day starter in 2013 and 2014... Reached 30 games pitched for the sixth consecutive season…Is one of seven MLB pitchers with such a streak (James Shields, Max Scherzer, Jon Lester, Ian Kennedy, Cole Hamels and Madison Bumgarner)... Took the loss 7/23 vs. SEA...Went 3.0 innings, his shortest start since 5/26/11 at CHI (2.2IP)...Had his streak of 60 consecutive home starts with at least 5.0 IP snapped, which at the time was the longest active streak in baseball... Allowed 14 first-inning runs while opponents hit .303 (36-for-119) in the opening frame. Led the club with 33 starts (T2nd in AL), 214.1 innings pitched (4th in AL) and 20 quality starts (T8th in AL)...Was his 5th consecutive season with 200+ innings...Is one of three pitchers to make 30+ starts in five consecutive seasons thru 2015 (Shields/Gallardo). • His 654.2 innings over the last three seasons are the most by a Blue Jays hurler over three seasons since Roy Halladay tossed 710.1 from 2007-09. • Has thrown the 4th most pitches in MLB since 2012... Only Shields, Scherzer and Lester have thrown more. • Lost just one of his last 14 starts recording a 2.88 ERA and .230 opponents' average...At Rogers Centre had a 9-3 record with a 3.11 ERA and a .197 opponents' average...The .197 average ranked 3rd in the AL behind Dallas Keuchel (.186) and teammate Marco Estrada (.195)...Had a 6-GM win streak over his last eight home starts is 6-0 with a 1.94 ERA. • Earned career win #100 vs. TB, Sept. 25…He and teammate David Price both posted their 100th victory for the club becoming the first teammates to do so since Dan Haren and Joel Pinero for LAA in 2011. • Did not pick up his 1st road win of 2015 until his 10th outing with a 5-2 win at OAK on July 23...Won just two of his 16 road starts. • Club won each of his 10 starts from July 23-Sept. 8, which is tied for the 4th-longest such streak in franchise history and the longest since TOR won 14 consecutive starts by Roy Halladay in 2003...During the 10 start stretch, Dickey recorded victories in seven for his longest win streak since a career-high 11 in 2012. • Knuckleball was tough to square up in 2015, posting the 4th best BABIP in the AL at .258. • Received a no-decision in an 8-5 win at PHI on Aug. 18 (4IP/5ER)...The outing snapped the Blue Jays franchise record of 20 consecutive starts with 3 ER or less (7/26-8/16). • Was the 4th fastest pitcher in between pitches in MLB at 18.0 seconds (teammate Mark Buehrle is 1st at 15.9 seconds). • Became the first 40-year old to start the home opener for the Toronto Blue Jays on April 13 vs. TB...Walked five, his most since walking five on April 17, 2014 at MIN...Lost 2-1 with both runs being walked in. • Failed to strike out a batter in two consecutive starts May 4-10 (1st time in his career) & in three of four outings from April 24-May 10…Went 16.0 IP without a strikeout. • Did not allow a stolen base over his final 17 starts and just 17 since joining the club in 2013. • As a Blue Jay has allowed 86 home runs (2013-15), tied with Dan Haren for the most in MLB. • With his win on May 4 became the 4th different Blue Jay pitcher to win a game at 40+ years of age…Joined Darren Oliver (6x), Dan Plesac (1x) & Dave Stieb (1x) on that list. • On May 4 vs. NYY became the 1st TOR pitcher to work eight innings without registering a SO since Edwin Hurtado in a no-decision vs. CWS on Aug. 26, 1995…The last TOR pitcher to win a game in which he went at least 8.0 IP & failed to record a SO was John Cerutti in a 4-1 victory at Minnesota on July 27, 1988. • Over his last 16 starts (12 quality) posted a 8-2 record with a 2.78 ERA...Allowed two earned runs or fewer in five of his last six starts…Walked two or fewer batters in his last 17 consecutive games. • Since joining the Blue Jays in 2013 has posted a 2nd half record of 21-8 with a 3.30 ERA. • In his first 11 starts of 2015 recorded a 5.53 ERA...Posted a 3.12 ERA in his last 21 outings. • Allowed one run in a CG win (5-1) over CLE on Sept. 2...Was his 7th consecutive win to even his record... Over the last 77 seasons, the only other pitchers to reach the .500 mark by winning seven or more consecutive decisions are Bob Veale in 1969 (8 straight wins with a 4-11 record), Rich Dotson in 1982 (8 straight wins with a 3-11 record), Scott Karl in 1997 (8 straight wins with a 2-10 record) and Roy Oswalt in 2010 (7 straight wins with a 6-13 record). • Tossed his 1st CG of the season & 14th of his career vs. LAA on May 21…Was his 5th CG as a Blue Jay & 1st since July 3, 2014 at OAK (loss)…Was his 1st CG in a victory since June 26, 2013 at TB (shutout)…Prior to this start had lost his last three starts in which he recorded a complete game…Marked his 1st career CG at Rogers Centre. • Was the 2nd oldest player in MLB at season's end (L. Hawkins). • Started game four of the ALDS, becoming the oldest starting pitcher to make their postseason debut in MLB history. • In his second start of the postseason, game four of the ALCS, lasted only 1.2 innings pitched- the second shortest start of his career (last: 1.1 IP on June 13, 2004 vs. STL). • The 1.2 innings pitched in that start was the shortest start in any postseason game in franchise history (previous: Todd Stottlemyre, 2.0 IP game four of the 1993 World Series). • Became the first starter in the playoffs to fail to record 2.0 IP since Jeremy Hellickson of Tampa Bay on October 8, 2013 in the ALDS vs. BOS. Led the club with 34 starts (T-1st in MLB), 215.2 innings (8th in AL), 14 wins, a .233 opponents' average (6th in AL) and 23 quality starts (7th in AL) .. Along with Buehrle posted 200+ innings marking the 1st time the same two Blue Jays have posted 200+ innings in back-to-back seasons since 1986-87 (Key/Clancy) ... Was his 4th consecutive season with 200 or more IP ... Had an identical 14-13 record as in 2013 with the same number of starts (34). His 440.1 innings over the last two seasons are the most by a Blue Jays' hurler over two seasons since Roy Halladay tossed 485 innings in 2008-09 and ranked 2nd in the AL to Shields (455.2). Tossed at least 6.0 IP while allowing two earned runs or less in 19 of 34 starts, including eight of his last 10. Allowed just three stolen bases this season, T-9th in AL for fewest. Was the 2nd quickest pitcher in the Major Leagues, taking only 18.3 seconds between pitches...Teammate Mark Buehrle was 1st at 17.3. Recorded a 7-4 record with a 2.94 ERA in 14 starts vs. AL East opponents, including a two-hit outing at TB on Sept 2 (7IP/2H/2ER), his fewest since giving up two at TB last season (June 26)...Posted four wins vs. the Red Sox becoming the 1st Major League pitcher to do so since Gustavo Chacin defeated Boston four times in 2006. Had a 5-game win streak snapped on the last day of the season ... Represented his longest since a career-high 11-game streak in 2012. Limited opponents to a 2.45 ERA in innings 1-4 (136IP/37ER)...From the 5th onwards ERA rose to 5.87 (79.2IP/52ER). Suffered his 2nd straight loss on Opening Day…Matched his career-high with six walks (2nd time, last on Sept. 17, 2011 at ATL) … Became the 1st TOR pitcher to allow multiple walks in three separate innings since Ricky Romero on Aug. 21, 2012 at DET…The six walks were the most recorded by any TOR pitcher in an Opening Day contest. June 14 at BAL left the game after 6.2 innings with a groin strain...Was pushed back two days, making next start on June 22. Lost four starts consecutively for the 1st time in a single season since 2004 from June 14-July 3... Had a string of seven consecutive quality starts from April 22-May 24. Recorded his 1,000th career strikeout on June 27 vs. CWS in the 3rd inning (Flowers). Started consecutive games July 13-18 (prior to and after break) for the club having started the last game before the All-Star break ... Last Blue Jays hurler to do so was A.J. Burnett under same circumstance in 2008. On July 3 at OAK tossed only complete game of the season, despite losing 4-1...Allowed four runs (two earned) over his eight innings...Marked his 4th complete game as a Blue Jay, however has lost each of his last three Finished his season by going 6.0+ IP in 19 of his last 20 starts...Over his last seven starts has posted a 2.35 ERA with an AL-low .178 opponents' average. Posted a 4-1 record with a 2.48 ERA with a .171 opponents' average in September...Since 2011 now owns a 12-6 record in Sept. with a 2.73 ERA and a .219 opponents' average. Posted a walk rate of 4.5 per nine innings over his first 10 starts of 2014...In the following 24 his walk rate dropped to 2.54 per nine. Was the 6th oldest player in the AL as season's end. Has thrown the 4th most pitches in baseball since the 2012 season at 10377, behind Shileds, Verlander and Lester. Led the club in many categories, including starts (34), innings (224.2), wins (14), strikeouts (177) and quality starts (19)...His 4.21 ERA was 2nd on the team to Buehrle. Ranked 2nd in the AL in innings (224.2), T-8th in wins (14) and 14th in strikeouts (177)...Threw 3505 pitches, 5th most in the AL. Posted three complete games to rank 2nd in the AL (Sale -4)...Starting June 21, recorded at least six innings in all but one of his 19 starts ... Recorded 131.0 innings ranking 3rd among all Major League hurlers (D. Price & A. Wainwright led with 131.2) over that span. Along with Buehrle posted 200+ innings marking the 1st time two Blue Jays have done so since 2008 (Halladay/Burnett) ... His 224.2 innings were the 2nd most of his career (2012-233.2) and was the 3rd consecutive season with 200 or more. Allowed 35 home runs for a 1.40 HR/9...The 35 home runs were a career-high and was one short of the club record held by Woody Williams in 1998...Marked the 2nd highest total in the majors (Griffin, 36)...Surrendered 23 home runs at home, ranking 2nd in the league behind Baltimore's Tillman (24)...Had not allowed more than 1.00/9 since the 2009 season. Fared much better with the Rogers Centre roof closed, posting a 3.18 ERA (62.1 IP/22 ER) in nine starts, including seven home runs...In his nine starts with the roof open recorded a 6.67 ERA (54.0 IP/40 ER), with16 home runs. Started Opening Day becoming just the 5th pitcher to win a Cy Young the previous season and start an opener for a different team (Maddux, Cone, P. Martinez, Clemens). Selected by the BBWAA as the 2012 Cy Young Award Winner becoming the first knuckleballer to win the award...Became the Mets first 20-game winner since Frank Viola, who won 20 games in 1990, and sixth in team history... Joined Tom Seaver, Jerry Koosman, Dwight Gooden, David Cone and Viola...Set career-bests in wins (20), innings pitched (233.2), ERA (2.73), complete games (five), shutouts (three), and WHIP (1.05)...Named to the 2012 National League All-Star team, the first such honour of his career... Pitched 1.0 inning, allowing no runs...Ranked in the top two in all three NL triple crown categories (wins, ERA, strikeouts)...Tied for second in the Major Leagues with 20 wins... Struck out 230 in 233.2 innings, which ranked third in the Majors and first in the NL... Was fourth in the Majors and second in the NL with a 2.73 ERA... Finished fourth in the NL with a 1.05 WHIP... Finished first in the NL with 22 starts of pitching at least 7.0 innings... Recorded 27 quality starts, to lead the Majors... His strikeout to walk ratio of 4.26 ranked fourth in the Majors and third in the NL... Limited opposing righthanded batters to a .218 (102-468) batting average, good for seventh in the NL... Had 15 starts in which he struck out eight or more, tying him for second in the Majors...Was the National League Pitcher of the Month for June... It was his first career Pitcher of the Month honour... Began the month with 37.0 consecutive innings without surrendering an earned run... The streak dated from June 2 vs. St. L to June 24 vs. NYY... Went 5-0 in six starts, leading the Majors for the month in ERA (0.93), innings pitched (48.1) and strikeouts (55)...His five wins are also tied for the most in the majors...Struck out an NL-leading 230 batters... Struck out double-digits seven times, the most in the NL... Set his career-high total in strikeouts three different times this season... Recorded 12 and 13 strikeouts in back-to-back starts at TB on June 13 and again vs. BAL on June 18, respectively, setting a new career-high each time... First set his career-high by striking out 11 at PIT on May 22... Matched his career-high with 13 strikeouts in his start vs. PIT on Sept. 27...Became the 10th pitcher since 1900 to record consecutive one-hitters (June 13 at TB and June 18 vs. BAL)... Became the first pitcher in modern baseball history (since 1900) to register back-to-back complete game one-hitters with 10 strikeouts or more in both starts... Became the first pitcher to throw consecutive one-hitters since Toronto's Dave Stieb in 1988... Stieb one-hit CLE on the road on Sept. 24 and then allowed one hit vs. BAL on Sept. 30... The last National Leaguer to do so was Jim Tobin for the 1944 Boston Braves, who tossed a one-hitter on April 23 vs. PHI and a no-hitter on April 27 vs. Brooklyn... His June 24 start vs. the Yankees ended three streaks: 44.2 innings pitched without allowing an earned run, 52.2 innings pitched without allowing a home run, and 105 at-bats without allowing an extra-base hit...The start also snapped his 11-game quality start streak... Hurled five straight starts where he did not allow an earned run and notched eight or more strikeouts from May 22-June 18, the longest such streak in Major League history... The previous mark was four by Gaylord Perry (1967), Ray Culp (1968) and Pedro Martinez (2002)...Since 2010, has posted a 2.95 ERA (202 earned runs/616.2 innings)... Among pitchers with at least 500.0 innings since 2010, his 2.95 ERA ranks fifth best in the NL...Pitched at least 7.0 innings and allowed one run or less 15 times... The total was the most in the National League and two behind Felix Hernandez (Seattle) for the Major League lead with 17...Went 13-1 in day games...The 13 daytime victories were the most wins in the Majors since Rick Reuschel went 15-5 in 1977 for the Chicago Cubs. Set career-highs in innings pitched, starts, and strikeouts. ... Finished the season with 12 straight quality starts dating back to July 25, the longest such streak of his career. ... Tied for the longest in the NL (Javier Vazquez and Tim Hudson) and tied for the second longest in the majors in 2011 (Jered Weaver, 15). ... The 12-game run also ties Vazquez for the longest active streak in the majors. ... Finished with 22 quality starts to lead the team. ... Recorded a career-high 10 strikeouts vs. Pittsburgh on May 31. ... Also fanned nine batters vs. Oakland on June 22, the second-highest total in a game for his career. ... Threw his fourth career complete game, and third as a Met, in a 3-2 loss at Pittsburgh on June 11. ... Pitched at least 7.0 innings in 16 of his 32 starts. ... Also pitched into the eighth inning in three straight starts from May 31-June 11, the first time in his career in which he accomplished that feat. ... Tossed at least 5.0 innings in 30 of his 32 starts and in 55 of his 58 starts since joining the Mets in 2010. ... Posted a 6-4 record and a 2.99 ERA (31 earned runs/93.1 innings)in 15 road starts. ... Pitched 12.2 scoreless innings over three starts from May 20-May 31. ... Went 2- 0 wit h a 2.08 ERA ( six earned runs/26.0 innings) in four starts during Interleague play. ... His 2.08 ERA was tied for ninth-best in the Majors and third-best in the NL among pitchers with at least four Interleague starts. ... Also held Interleague opponents to a .198 batting average, tied for the seventh-best mark in the Majors and tied for second best in the NL among the same qualifiers. ... Since joining the Mets, Dickey is 5-0 with a 1.72 ERA (nine earned runs/47.0 innings pitched) in seven Interleague starts. ... The five Interleague wins are tied for third-most in the Majors since 2010. ... The 1.72 ERA is second-best in the Majors among pitchers with at least five starts during Interleague play since 2010. ... Compiled a 1.82 ERA in September (seven earned runs/34.2 innings),which ranked eighth in the Majors among pitchers with at least five September starts. ... Committed just his second error as a Met in a start on August 10. ... Made the second Home Opening Day start of his career and first with the Mets on April 8 vs. Washington. ... Suffered the loss, working 5.0 innings and allowing three runs. ... Started the Texas Rangers' home opener in 2004 vs. Anaheim. ... Made his 100th major league start on August 21 against the Brewers at Citi Field. ... Since 1947, the only pitcher who was older at the time of his 100th career start than Dickey (36 years, 296 days) was Masato Yoshii (age 36 years,356 days on April 11, 2002) with Montreal. ... Other than Yoshii, the last pitcher to make his 100th big league start at such an advanced age was Ed Heusser in 1946 (age 37 years, 103 days) with Cincinnati. Set career highs in wins, starts, innings, strikeouts, and complete games in hisfirst season with the Mets...Finished seventh in the National League in ERA, fourth with a 1.99 homeERA (18 earned runs/81.1 innings) and third with a night ERA of 2.53 (33earned runs/117.1 innings)...His walk per nine inning rate of 2.2 was thebest of his career and the third-best mark in the NL...Finished the season with five starts where he did not walk a batter, afterentering the season with only three starts for his career with no base onballs...Allowed just three runs and limited opponents to a .156 (14-90) battingaverage, with three extra-base hits and 22 strikeouts in the initial frame...The .156 batting average was the best mark in the major leagues amongqualifying pitchers...Threw a one-hitter, the 35th in franchise history, to beat the Phillies, 1-0, onAugust 13th at Citi Field...It was the second complete-game effort ofDickey's career and the only hit he allowed was a line-drive single by pitcherCole Hamels...He struck out seven, one off his season-high, and walkedone...Also paired with Johan Santana, who had thrown a shutout in his startthe night before, to become the first Mets pitchers to post consecutivecomplete-game shutouts since Pedro Astacio and Jeff D'Amico tossedback-to-back two hitters on May 14 and May 15, 2002 at Los Angeles...Thelast pitcher to throw a complete-game one-hitter in a 1-0 victory with theonly hit by the pitcher was Sandy Koufax on May 23, 1960...Bennie Daniels(a career .170 hitter) got the only Pittsburgh hit that night, a second-inningsingle...Finished with 11 wins even though he did not pick up his first win until May25, in the Mets' 46th game of the season...It's only the fifth time that a pitcherhas reached double figures in wins for the Mets in a season in which he didnot record a victory in any of the team's first 45 games (Bob Shaw, 1966;Rick Aguilera, 1985, 1986; Dwight Gooden, 1987)...Set a Mets record and led all major league pitchers by handling 61 totalchances without an error...Broke Tom Glavine's club record set in 2005,when the lefthander had 55 total errorless chances...Went 7-1 with a 1.74 ERA (13 earned runs/67.1 innings) in his first ninestarts at Citi Field...That was the lowest ERA in franchise history through apitcher's first nine home starts for the Mets...Finished with four, two-hit games, the most multiple-hit games in one year by a Mets pitcher since Mike Hampton hadfive in 2000 to tie the club record set by Dwight Gooden in 1985...Started the season with Buffalo (AAA) of the International League, where he threw a near perfect game...Set a Buffalomodern-day record when he retired 27 straight hitters on April 29 vs. Durham...Fernando Perez singled on an 0-2 pitchto start the game before Dickey set down the next 27 hitters in order...He needed just 90 pitches, throwing 68 forstrikes in his second complete game of the season...Went 4-2 with a 2.23 ERA for the Bisons...Had his contract selected from Buffalo (AAA) of the International League on May 19...Made his first start that night atWashington...Received a no-decision in the 5-3 loss after going 6.0 innings...Became the first pitcher in Mets history to go 6-0 in his first seven starts with his 8.0-inning shutout win on June 23 vs.Detroit...Previously, three pitchers had gone 4-0 in their first five starts (Ray Sadecki, 1970; Harrry Parker, 1973; and TerryLeach, who did it over a four-year span, 1982-1985)...No one other than Dickey went 5-0 in their first six starts...Established a career-high six-game winning streak from May 25-June 23...During the streak, recorded a 2.23 ERA (10earned runs/40.1 innings) and struck out 33...His previous winning streak was four straight games from August 3-August20, 2003...Lasted 5.0 innings on June 28 at Florida, his first start this year he did not go 6.0 or more innings...That snapped acareer-high streak of seven consecutive starts with at least 6.0 innings pitched...His previous high was five consecutiveturns with at least 6.0 innings pitched while with Seattle from June 24-July 22, 2008...He went at least 7.0 innings in 13turns this season, after this season with only 11 starts of that length or more...Allowed consecutive home runs to Melky Cabrera and Omar Infante in his start against Atlanta on July 9 to snap acareer-high string of 45.1 innings without allowing a home run...His start on July 29 came on three-days rest...Became just the second pitcher over the past four seasons to start a gameon short rest (no more than three days between starts) and throw more than 8.0 shutout innings...The other was JohanSantana who accomplished the feat in a 2-0 shutout win for the Mets against the Marlins on the next to last day of the2008 season...Allowed a run in the second inning of his start on August 3 to snap a career-best 18.0 inning scoreless streak...The streakdated back to the fifth inning of his start on July 20 at Arizona...Won a career high-setting 10th game on September 8 at Washington...Went 6.0 innings and allowed two runs, earned,on five hits in the Mets 3-2 victory...Did not walk a batter for the fourth time...Set a career-high with his second complete game of the season, beating the Pirates 9-1 at Citi Field on September 14...Struck out four and allowed five hits...Also in that contest, he recorded his 95th strikeout to set a career-high...Hisprevious best was 94 strikeouts in 2003 with Texas. Made the Twins' Opening Day roster and made his first and only start on April10th at Chicago (AL)...Earned the win with 5.0 innings of three-run ball...Moved to the bullpen and made 34 more appearances...Recorded nine consecutive scoreless outings (12.2 innings), June 3rd-June 28th...Went at least 4.0 innings in three straight appearances from May 18th throughMay 30th...Optioned to Rochester (AAA) of the International League on August 7th...Was designated for assignment on August 29th...Threw a complete game shutout on August 26th vs. Lehigh Valley. Started the season at Triple-A Tacoma (Seattle)...went 1-1 in two starts allowing six runs (four earned) on 10 hits in 15.0 innings...recalled by Seattle on April 14 and pitched 1.0 scoreless inning of relief that night vs. Kansas City, marking his first game in the Majors in over two years (April 6, 2006)...made two relief appearances for the Mariners and was sent back to Tacoma...started five games and was recalled to Seattle...tossed 14.0 consecutive scoreless innings from May 23-June...earned his first win of the season on June 9 at Toronto, pitching 2.0 scoreless inning of relief, first win since September 18, 2005 vs. Seattle...tossed 7.0 shutout innings June 24 at New York (NL), picking up his second career hit (single)...worked 7.0 innings in back-to-back starts for the first time in his career July 31 at Texas and August 5 vs. Minnesota...tied an MLB record, throwing four wild pitches in the fifth inning of a game August 17 at Minnesota (fifth MLB pitcher with four)...went 2-0, 2.00 (36.0 ip, 8 er) with a .205 batting-average-against in 18 relief appearances with the Mariners and did not allow a run in 13 of those 18 relief appearances. Spent the entire season withNashville (AAA) of the PacificCoast League, leading the leaguewith 13 wins...Named Pacific Coast League Pitcherof the Year...Signed a minor league contract with Minnesota on November 29th, but wasselected by Seattle in Major League Baseball's Annual Rule V Draft onDecember 6th. Took the loss in his only start with the Rangers on April 6th vs. Detroit,allowing eight hits and seven runs in 3.1 innings pitched, while tying amodern major league record by giving up six home runs...Optioned to Oklahoma (AAA) of the Pacific Coast League on April 7th...Wasdesignated for assignment on April 23rd...Was outrighted to Oklahoma on April26th...Made four trips to the Disabled List during the season with a sore rightshoulder. Went 1-2 with a 6.67 ERA in 9 games/4 starts over 2 stints withTexas in 2005...made Opening Day roster for second consecutiveseason...was 0-1, 8.10 (6 ER/6.2 IP) in 5 relief appearances in firststint from April 5-13...took loss in home opener, on April 11 vs. LosAngeles of Anaheim, allowing a solo homer to Orlando Cabrera tolead off the 10th inning...left game on April 12 vs. Los Angeles ofAnaheim due to injury...placed on the 15-day disabled list on April13 with right triceps inflammation...activated from the disabled listand optioned to Oklahoma on May 25...was recalled on September12 and went 1-1, 6.26 (16 ER/23.0 IP) in 4 starts in 2nd majorleague stint of 2005...made first big league start of the season onSeptember 13 vs. Baltimore, allowing 3 runs in 7.0 innings to take no decision...was first quality start since June 2, 2004 atCleveland...earned lone ML win of the season on September 18 vs. Seattle, despite allowing 6 runs in 5.2 innings...held opposingbatters to a .233 average (20-86) in 4 September starts to lower overall average against from .321 to .254. Oklahoma: Went 10-6, 5.99 (81 ER/121.2 IP) 19 games/17 starts for the RedHawks...10 wins led Oklahoma staff and ranked T5thin the Pacific Coast League...also led RedHawks hurlers with 121.2 innings pitched, 81 strikeouts and 39 walks, while his 17 startstied for 2nd-most on the staff...was 7-1, 4.41 (25 ER/51.0 IP) with 39 strikeouts in his last 8 regular season appearances forOklahoma, lowering his season ERA from 7.13 to 5.99...went 2-0, 1.39 (2 ER/13.0 IP) in last 2 regular season appearances for theRedHawks...earned win in lone PCL playoff start on September 8 vs. Nashville, allowing 3 runs in 7.0 innings. 2005 Notes: Made 5 of his 9 appearances against Los Angeles of Anaheim...used knuckleball as his primary pitch during his 2ndstint with the club...began throwing the knuckler with Oklahoma in July...worked on the pitch with Rangers Hall of Famer CharlieHough during a road trip to Anaheim in September. Made 25 appearances for Texas, including career-high 15 starts,and spent 2 stints on the disabled list...ranked T3rd on staff with 5quality starts, T4th in starts and 2nd with 4 pickoffs. Summary: Made Opening Day roster as Rangers' 4thstarter...made season debut in home opener on April 9, earningwin by allowing 3 unearned runs in 7.0 innings...permitted 9 runsin 2nd start, but went 4-1, 3.48 (13 ER/33.2 IP) through his first 5starts of the year...tossed season-high 8.2 innings in last start ofthat stretch on May 2 vs. Boston, falling one out shy of ashutout...still earned win in finale of a 3-game sweep over RedSox, retiring 14 straight hitters from the 3rd-8th innings...went 1-6over next 13 outings from May 8-July 29, a stretch which included2 disabled list stints...was 1-0, 3.00 (5 ER/15.0 IP) with one saveover final 7 appearances, all in relief...tossed 3.2 shutout inningson Sept. 25 vs. Seattle to earn win, allowing just onebaserunner...first batters were just 1-9 (.111) with a walk while heallowed 2 of 8 inherited runners to score...was 4-7, 6.39 in 15 startsand 2-0, 2.78 in 10 relief outings. Disabled List: Was on the disabled list from June 25-July 18 andJuly 30-Aug. 22, both times with a strained right rhomboid musclein his back...made pair of rehab appearances with Frisco (AA) duringboth DL stints, going a combined 1-1, 1.98 (3 ER/13.2 IP) in 4games/starts. Other Notes: Earned 2nd career save on Sept. 30 vs. Anaheim inclub's home finale, one of 4 Texas relievers with a save last season...tossed at least 5.0 innings in 11 of 15 starts...went 1-1, 3.38(12 ER/32.0 IP) in 7 games/4 starts against AL Central clubs...was 2-0, 1.59 (3 ER/17.0 IP) with a save in 4 games/2 starts againstAnaheim...did not allow a homer over 3 starts and 22.0 innings from April 21-May 2...recorded season-high 7 K's on both April 21 atAnaheim and June 2 at Cleveland. Appeared in 38 games for the Rangers and went 9-8, 5.09 with one save...went 5-5, 5.25 (43 ER/73.2 IP) in 13 starts and 4-3, 4.81 (23 ER/43 IP) in 25 relief appearances...finished second on the staff in strikeouts (94), was third in innings (116.2), and tied for third in wins (9), the latter matching the second most by an AL rookie...his .529 winning percentage was tops among AL rookies with 100 or more innings pitched...ranked third among AL rookies in strikeouts (94) and pitched fifth most innings (116.2)...as a reliever, allowed a run in 14 of 25 games...permitted 9 of 23 inherited runners to score, including just one in 3 bases loaded situations...first batters hit .273 (6-22)...recorded first big league victory in relief on April 24 vs. Boston...worked 6 or more innings 7 times...fanned career best 7 batters, August 20 at Detroit...opponents hit .292, .280 (69-246) vs. left-handed batters and .304 (66-217) against right-handers...Texas was 6-7 in his 13 starts...went 1-1 at the plate with single in first big league at-bat, June 7 vs. Montreal in San Juan...pitched a 6-hit complete game shutout on August 20 at Detroit...first CG shutout by a Texas pitcher since Kenny Rogers, April 19, 2002 at Seattle, a span of 272 games between CG shutouts...the first CG shutout by a Texas rookie since Rick Helling, May 6, 1994 vs. Minnesota and the 12th CG shutout ever for a Texas rookie, the second in the last 15 seasons...was his first professional CG shutout and was one of 4 CG shutout by an AL rookie in 2003...recorded first major league save 2 days earlier on August 18 at Detroit...according to research done by the Elias Sports Bureau, that was the shortest span for a pitcher with first major league CG shutout and save in major league history...previous shortest span had been by Jackie Brown, also with the Rangers: save on July 26, 1973 vs. California and CG shutout on July 29, 1973 (game one) at Oakland. Summary: Contract purchased from Oklahoma (AAA) on April 13...posted a 2.63 ERA in his first 8 appearances with a 3.18 (8 ER/22.2 IP) figure in his first 13 outings through May 23...had an 8.78 ERA (13 ER/13.1 IP) in his next 8 games before option to Oklahoma on June 19...recalled on June 30...hurled 4 scoreless innings in 2 relief outings before joining the rotation on July 11...of his final 15 appearances of the season, 13 were starts...lost first 2 starts, then was 4-0, 3.27 (12 ER/33 IP) in his next 5 games through August 20...went 4-1 in August to set a club record for rookie wins in a month (tied by Colby Lewis in September)...0-3, 10.80 (20 ER/16.2 IP) in his next 4 starts before finishing the year at 1-0, 2.77 (4 ER/13 IP) in 2 outings. Spent entire season at Oklahoma, leading the RedHawks in innings (154) and strikeouts (109), matching the team high for wins (8) and tying for second in starts (19)...went 8-4, 3.75 (50 ER/120 IP) in 19 starts and 0-3, 5.29 (20 ER/34 IP) in 18 relief appearances...opponents batted .295 (176-597)...posted a 3.99 ERA (17 ER/38.1 IP) in first 17 games, 15 of those in relief, through May 24...beginning May 31, 17 of last 20 outings were starts, including final 14 beginning June 24...went 7-2, 3.41 (34 ER/89.2 IP) in final 13 starts, going 5-1, 1.70 (8 ER/42.1 IP) in last 6 games...won his final 4 contests with a 1.95 ERA (6 ER/27.2 IP)...worked 6 or more innings 13 times, including final 8 starts...had season-high 8 strikeouts in win, August 7 at Fresno, which was his lone complete game...lost Game 3 of PCL playoffs vs. Salt Lake City, despite allowing one run in 8 innings...pitched winter ball for Zulia in Venezuela, going 2-4, 3.21 in 8 starts. Posted 10th best ERA in the Pacific Coast League (3.75)...led Oklahoma staff in wins (11), complete games (3), and innings (163), tied for first in starts (24) and was second in strikeouts (120)...matched the most victories of any Texas minor league pitcher and had sixth lowest ERA...purchased by the Rangers on April 19...pitched one scoreless inning in major league debut on April 22 versus Oakland, then allowed 9 runs in 11 innings in his last 3 games...lost to Chicago on May 7...permitted 3 of 4 inherited runners to score with first batters going 1-4...optioned to Oklahoma for rest of season on May 8...1-3, 7.25 (18 ER/22.1 IP) in first 4 starts after return to RedHawks, then went 6-2, 2.88 (30 ER/93.2 IP) in his next 13 contests...lone complete game victory was on July 6 at Memphis (9 IP)...pitched 6 or more innings 22 times, including last 17 starts...fanned season-high 9 batters on July 24 vs. Las Vegas...opponents hit .262 (164-625). Went 7-9, 4.35 (68 ER/140.2 IP) in 23 starts and 1-0, 5.60 (11 ER/17.2 IP) in 7 relief appearances at Oklahoma...Led the RedHawks in innings (158.1), tied for first in starts, tied for second in wins (8) and complete games (2), and was second in strikeouts (85)...started the season in the bullpen and went 1-0, 2.51 (4 ER/14.1 IP) in 6 games...earned lone save on April 19 at Colorado Springs...moved to rotation for remainder of season on April 29...0-4 in first 10 starts before going 7-5, 3.51 (33 ER/84.1 IP) in final 13 games, including 3-1, 2.70 (9 ER/30 IP) in final 4 outings. Combined for a 7-9 record and 10 saves with a 4.51 era (59 er/117.2 ip) in 41 appearances/13 starts at Tulsa and Oklahoma...Ranked 4th in the Rangers' minor league organization in saves...Set career-highs in wins, starts, innings and strikeouts (76). Led the Florida State League with 38 saves in 57 appearances for Charlotte, equaling the FSL record for saves in a single season...The 38 saves were the 2nd most in the minors in 1998 and tied the Rangers minor league record for saves (Kerry Lacy, 1993, Charleston-Charlotte)...Also led the FSL with 54 games finished...Was named to the FSL post-season all-star team...Finished 2nd in voting for the 1998 National Association Rolaids Relief Man Award...Held opposing hitters to a .249 (58-233) average, including a .241 (42-174) mark by righthanders...Did not allow an er in 1st 6 outings, Apr. 8-21, earning saves in each...Was 1-0, with 19 saves and a 3.00 era (9 er/27.0 ip) in 25 appearances in May and June...Had 5-game save streaks May 2-11 and May 29-June 6...Did not allow a run in a season-high 7 straight games, May 24-June 6...Finished out the season by not allowing a run in final 5 games, earning 4 saves. Went 1-4, 6.94 (27 er/35.0 ip) in 1997 with Charlotte...Did not allow an er in 7.0 innings on Apr. 26 vs. Dunedin...Lone win came in a start on May 7 at Vero Beach...Began to experience elbow problems in early May and was placed on the disabled list on May 11...Underwent arthroscopic surgery to remove a bone spur in elbow on June 16 and missed the remainder of the season...Pitched in the Hawaiian Fall League, going 3-0, 1.16 (3 er/23.1 ip). Was a non-roster invitee to the Rangers' major league spring training camp...Was the 1st of the Rangers' 2 1st round selections in the June, 1996 free agent draft, the 18th player in the nation picked...Prior to joining the organization, underwent an extensive physical examination and MRI which revealed no existence of a normal ulnar collateral ligament in right elbow...Pitched for the Rangers in the Florida Instructional League. November 2, 2017 RHP R.A. Dickey elected free agency. 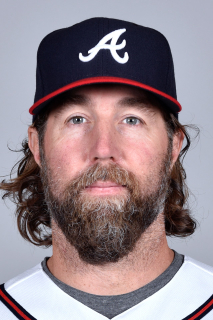 November 10, 2016 Atlanta Braves signed free agent RHP R.A. Dickey. November 3, 2016 RHP R.A. Dickey elected free agency. October 23, 2016 Toronto Blue Jays activated RHP R.A. Dickey. October 4, 2016 Toronto Blue Jays reassigned RHP R.A. Dickey to the minor leagues. June 22, 2015 Toronto Blue Jays activated RHP R.A. Dickey from the bereavement list. June 19, 2015 Toronto Blue Jays placed RHP R.A. Dickey on the bereavement list. May 19, 2010 New York Mets selected the contract of R.A. Dickey from Buffalo Bisons. January 5, 2010 New York Mets signed free agent RHP R.A. Dickey to a minor league contract and invited him to spring training. January 5, 2010 Buffalo Bisons signed free agent R.A. Dickey. October 6, 2009 RHP R.A. Dickey elected free agency. September 3, 2009 RHP R.A. Dickey assigned to Rochester Red Wings. August 29, 2009 Rochester Red Wings designated RHP R.A. Dickey for assignment. August 29, 2009 Minnesota Twins designated RHP R.A. Dickey for assignment. August 7, 2009 Minnesota Twins optioned RHP R.A. Dickey to Rochester Red Wings.